The benefits of playing piano for children are significant. 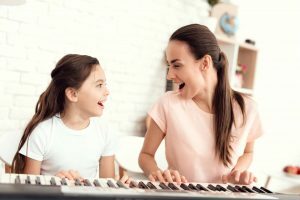 This article brings to light some of these in the hope that you will encourage your child to start their musical journey. While some children naturally excel at piano, few parents have the vision or expectation for their child to play professionally. It’s more important, rather, to look at the wealth of positive benefits and life experiences your child will gain from practicing this timeless instrument! We all know how vital creativity is for a child’s development. Avenues of creativity are essential and shouldn’t be downplayed or underestimated in their importance. The piano is an almost limitless avenue for creativity and imagination. It allows your child to not only learn other people’s music, but to develop their own ideas and compositions. In the right environment, piano practice is equal parts entertainment and fun as it is intellectual and educational growth. In addition to this, it’s been shown that musicians are naturally skilled in creative and divergent thinking. Divergent thinking is the ability to find new solutions to large open-ended questions. So, piano practice has the potential to increase your child’s ability to solve complex problems more creatively. This is a wonderful life-skill to encourage at an early age! You may have read that being a musician helps keep your brain sharp. Broadly speaking, this has been shown to be very true! Practicing an instrument strengthens the nerve fibres connecting the left and right sides of the brain. As a result of this, your child will benefit from long-lasting improvements to memory, problem solving and language skills just to name a few. Building on this understanding, the piano is one of the most effective instruments for ‘mental exercise’. It has 88 different keys, and requires a considerable amount of multi-tasking and coordination to play with two hands. When you consider other aspects of playing such as reading sheet music while maintaining posture and using the foot pedals, it’s easy to see that pianists are getting a full brain workout! Proficiency of the piano requires a significant amount of time and discipline. While kids can find this difficult at first, you’ll quickly discover that the structure and regular practice provided through lessons has numerous social and behavioural benefits! Firstly, the supportive and constructive environment a piano teacher provides can be great for your child’s behaviour patterns. Over time, you may notice that their attention span for tasks increases, and that they’re able to focus better. The communication aspect of piano lessons is also worth mentioning. One-to-one tuition allows kids to develop both listening and communication skills as they take new concepts onboard, and express to their teachers what they might be struggling with. These skills extend to other social situations as well. Learning an instrument provides an avenue for your child to make new friends and gives them a springboard from which to participate in other music opportunities as they arise. While we’ve seen that piano playing has a wealth of direct benefits to young minds, piano can benefit your child in other areas of their life too! This is especially true with their experiences and learning while at school. We briefly talked about attention span, however, this aspect is particularly relevant to a school environment. Many children, especially younger kids, struggle with focussing at school. While the ability to keep on task often increases with age, the guided discipline of piano lessons helps fast track this for students, and often bring noticeable improvements to how they do at school in general. It’s also worth noting the links between music and mathematics. Music performance, specifically, has been shown to enhance students’ ability to solve complex maths problems. This is because performing on an instrument, like the piano, reinforces the same part of the brain that is employed while doing numerical exercises. Children aren’t the only ones who benefit from the piano! We are seeing more and more adults beginning lessons. This includes those who are playing piano for the first time, as well as adults who have taken lessons in the past and want to pick it up again. Instead of having only your child learn to play the piano, learning together is a fun option to consider! Being able to play the piano is undoubtedly a wonderful thing. If you yourself have had experience with the instrument, or know someone who has you’ll know firsthand how enriching it can be. This is why I believe it is one of the greatest gifts you can give a child, and one they will almost certainly cherish and appreciate as they move forward in life. WHAT AGE CAN A CHILD START PIANO LESSONS?